Fiction – paperback; Allen & Unwin; 354 pages; 2011. Review copy courtesy of the publisher. Alex Miller is a London-born Australian writer with nine novels to his name. Two of these — The Ancestor Game (1993) and Journey to the Stone Country (2003) — have earned him the Miles Franklin Literary Award. His most recent novel, Lovesong, was released in Australia in 2009 but has just been published in the UK for the first time. Having never read any of Miller’s work before — I’ve got three of his novels in my always-growing To Be Read pile — I was anxious to see if this one would live up to the high praise I had heard about. The short answer is this: it did. The long answer is the review which follows. Lovesong is a story within a story. It’s not exactly metafiction, but it comes close. An elderly novelist searching for a subject to write about meets a middle-aged man with a story to tell. Ken is on the verge of retirement (“My last novel was always going to be my last novel”), who lives with his 38-year-old daughter, Clare. Their relationship isn’t exactly fraught, but there are clearly tensions between them. And it doesn’t help that Clare only moved in for a few weeks when she was newly separated from her husband — and that was five years ago! One day Ken notices a new pastry shop in his local neighbourhood, run by an intriguing couple: a North African woman in her early 40s — beautiful and self-possessed, but with a deep sadness in her eyes — and her Australian school teacher husband. They have a pretty six-year-old daughter. Ken becomes slightly obsessed with them and wants to find out how they met, “this Aussie bloke and his exotic bride”, and engineers a meeting with the husband, John Patterner. Over the course of many afternoons, lingering over coffee in a local cafe, John tells Ken his story. The story of himself and his wife, Sabiha, the beautiful woman from Tunisia whom he had married in Paris when he was a young man and she was little more than a girl. And the beautiful and terrible story of their little daughter Houria. Ken then spends his evenings secretly typing up what he has been told. He can’t help himself: he needs to write — “During my life I had acquired no skills for not working and I soon found that not writing a book was harder than writing one was” — and these form the bulk of the novel Lovesong. What he had initially predicted as a “simple love story” is far more complicated, and tragic, than he ever could imagine. John and Sabiha’s tale begins beautifully — and romantically — and brims with optimism for the future. But the couple work so hard running a busy and successful cafe in a seedy suburb of Paris that there is little time for anything else in their lives. By the time they realise they want different things — for Sabiha, a much longed for child, and for John, a permanent return to Australia — years have passed and it might be too late. Lovesong is, indeed, just that: a love song. But it’s also a story about regret, about thwarted dreams, about the ways in which love between two people can change over time. It is incredibly romantic, but authentic — Miller really gets inside the heads of his characters, both male and female, and presents either side of the gender divide with aplomb. There’s something about the cool, limpid prose that keeps sentimentality at bay. But despite its emotional detachment, this is one of the most affecting love stories I’ve ever read. It’s also one of the most thought-provoking. That’s largely due to the device of Ken — whose intelligent, writerly voice, only interrupts the main narrative on an occasional basis. But his presence begs the question: is he authorised to tell this tale? Or does John and Sabiha’s love story remain their’s alone to keep? I read “Journey to the Stone Country” last year (following a post here at RM about “Best Australian Novels” or some such), and I liked it a lot. Another good aussie writer! Journey to the Stone Country is one of those in my TBR. Im keen to read it now, if only to see whether the cool, detached prose style of Lovesong is apparent in his older work. He is one of those novelists Ive never explored because he largely came to attention AFTER I left Oz in 1998. Well this has made me feel much better. I was asked if I wanted to review Millers ‘Conditions of Faith’ and thought ‘oh yes’ only I had got in a muddle and thought it was Andrew Millers ‘Pure’ (silly me) and was thinking ‘oh dear’ but this one sounds like it’s very good indeed so I shall save ‘Conditions of Faith’ for just the right day! Sounds intriguing. I have never heard of this author before. This one seems a great read. I always loved books that as you said are “a story within a story”. I have Conditions of Faith in the pile, too. Funny that you should mix him up with Andrew Miller, because I’ve done that in the past, only the other way around. Kailana and Carolinareads, glad to have brought this one to your attention. It’s a lovely read, a bit heart-breaking and shocking in places, and I do wonder why John Patterner put up with so much — he’s an alarmingly passive character. I love the idea of a “story within a story” too. “Shocking and heartbreaking” make it sound even better. Just turned the last page of this, Kim. 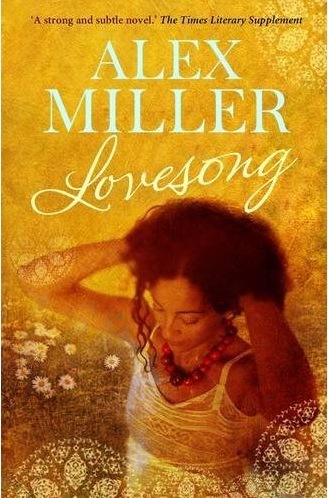 Another lovely book from Miller – what always strikes me about his work is how well he writes women. Or at least I think he does – certainly his women read as convincingly as women written by female authors, whereas sometimes I get the feeling male authors write women wrong just as I know women writers often get men wrong. Anyway, he always seems like a writer with incredible empathy and insight – Ken in ‘Lovesong’ talks about authors needing to be able to access “those difficult channels into themselves” and Miller seems an expert at this. If you enjoyed this I’d wholeheartedly recommend his “Conditions of Faith” which touches on many similar themes and shares the Australian/Parisian/Tunisian settings, but for me was even better. I only have ‘Prochownik’s Dream” left on my shelves to read now, and then I’m either going to have to find second hand copies of his first four or bite the bullet cost-wise and import them from Australia. He’s definitely entered my ranks of favourite authors who I have to read everything by.